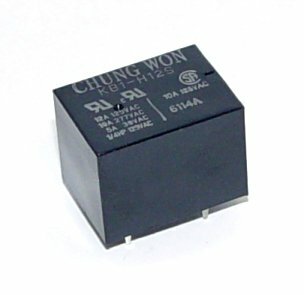 Power Relay, 12v, SPDT, PCB Mount, 10/12A 125VAC, 10A 277VAC, 1/4HP 125VAC. Manufactured by Chung Won. Appears similar and has same part number as Texcell KB1-H12S (Datasheet for Texcell in PDF). Also possible cross reference match to Tyco Electronics PCE series (Datasheet for PCE series in PDF).